JCCC counselors and staff come together to get two degrees conferred to a chronically ill student who wants to pick up a third. During a tough journey, it’s easy to see how far off your goal appears to be. You forget to turn around and see how far you’ve come. Sometimes it takes someone else to show you your successes. 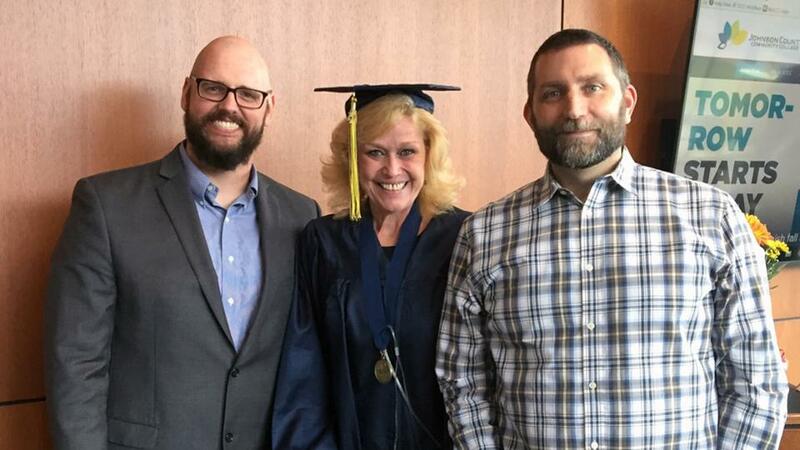 In student Phyllis Greenquist’s case, it was the employees at Johnson County Community College who showed her all that she’d accomplished: two completed degrees. It started like this: Phyllis really wanted to complete an Associate of Applied Science (AAS) degree in biotechnology. But she battles a genetic disorder called Alpha I Antitrypsin Deficiency, which leads to breathing problems and, over time, affects how well the lungs work. Phyllis uses a wheelchair, and she breathes using only 14 percent of her lungs’ capacity. Frequent health problems and hospital visits interfered with her classwork, and she shared her frustrations with her JCCC counselor, Andy Meenen. Phyllis said she wants to use her education to work for environmental causes and to advocate for others with disabilities. One of her favorite experiences at JCCC was working with CLEAR students as part of service-learning. College Learning Experiences, Activities and Resources (CLEAR) provides independent-living skills to adults with cognitive challenges. “There I was supposed to be helping them, and they were saying, ‘Are you OK? Do you need my help?’ and being there for me. They are the most selfless people in the world, and I’m glad to have had the chance to volunteer with them,” Phyllis said. She still hasn’t given up on her AAS — she said she’d like to finish it up in a semester or so — but if she doesn’t, she still has two degrees and a remarkable experience.